Fig. 1. The segment of the small intestine and Meckel's diverticulum (in section). Meckel's diverticulum is a congenital blind highlighting wall ileum (the remainder of patent vitelline duct) at a distance of 20-25 cm or more from the place where it flows into the blind intestine (figure). The structure of the wall of Meckel diverticulum is identical to intestinal. Inflammation of Meckel diverticulum - diverticulitis - by clinical often reminds acute appendicitis (see). However, diverticulitis pain are located not only in the right iliac region, but around the navel. Ulcers of Meckel diverticulum manifested by episodic pain, often in the right iliac region, and intestinal bleeding. Meckel's diverticulum may be the cause of intestinal obstruction (inversion, utoobasaurus). Treatment and surgery (removal). Meckel diverticulum [diverticulum Meckeli (J. F. Meckel junior)] - congenital diverticulum ileum. It occurs more often in men. Meckel's diverticulum is a remnant of the embryonic yolk-enteric duct (ductus omphaloentericus), connecting the embryo ileum with umbilical bubble. Usually this duct fully obliteriruta and resolved by the end of the 3rd month of embryonic life. At violation of the normal process of reverse development duct fully or partially remains open; one of the possible forms of such incomplete reverse development in the form of cleft that part of the channel, which is adjacent to the intestine, and is a Meckel's diverticulum. 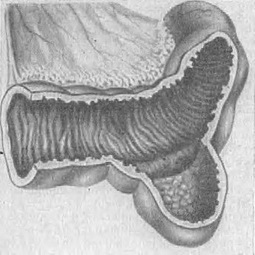 Meckel's diverticulum in the form of a blind process departs from different angles from the ileum (mostly from its open side) at a distance from 10 to 100 cm or more from the place where it flows into the blind gut (Fig. 1). The form of memorial plaques diverse: conic, cylindrical, kolloidnaja or other Length memorial plaques varies from 1-2 up to 25 cm or more, and the diameter from a few millimeters to the width of the small intestine and more. Most often, the Menshikov Palace is loose in the abdomen, sometimes has its own mesentery. In some cases it is in the form of fibrous cord is attached to the belly button or one of the organs of the abdominal cavity, or to the abdominal wall. Described cases of location of Meckel diverticulum in the inguinal or femoral hernia and even pinched it in Grajewo hole. Wall memorial plaques on the building does not differ from the wall of the terminal segment of the small intestine. Sometimes in the mucosa of the memorial plaques can be dystopic the regions of the mucous membrane of the stomach, duodenum and other bodies, which may serve as a ground for the emergence of peptic ulcers. In most cases, memorial plaques were no clinically manifested, sometimes accidentally detected by x-ray intestines, laparotomy or partition. Diseases of Meckel diverticulum include inflammation, peptic ulcer, tumor and foreign body (Fig. 2). Acute inflammation of the memorial plaques, or diverticulitis,is one of frequent diseases, the appearance of which contributes bends and narrowing of the diverticulum. On postmortem changes and clinical signs of diverticulitis is very reminiscent of acute appendicitis, differential diagnosis which is very difficult, and often impossible. Peptic ulcer memorial plaques usually progresses rapidly, accompanied by bleeding, penetration into the various organs and perforation of the diverticulum. The main symptoms of peptic ulcers memorial plaques are attacks of abdominal pain and especially intestinal bleeding. Sometimes only a perforation is the first and only symptom of ulcers memorial plaques, which may be asymptomatic. Benign and malignant tumors of Meckel diverticulum are rare and can be varied in nature. In the Menshikov Palace may be a foreign body (fruit seeds, fish bones, and others), feces stones and roundworm that cause ulcers, perforation and peritonitis. Memorial plaques is sometimes a cause of umbilical fistula (Fig. 2). Diseases of the Menshikov Palace as a rule, are recognized only during operations, although described many cases correct preoperative diagnosis of these diseases. Memorial plaques can cause acute or chronic intestinal obstruction. Lethality of diseases associated with the presence of memorial plaques, high, because, as a rule, late diagnosis. 8 - umbilical hernia Rothera. Treatment. At various diseases of Meckel diverticulum or pathological conditions caused by it, it is subject to rapid destruction. Accidental discovery memorial plaques during laparotomy on another occasion the destruction it is also desirable, if there are no contraindications of the General condition of the patient. Ablation technique memorial plaques different depending on the peculiarities of its structure. If the basis of Meckel diverticulum narrow ablation technique is identical technique appendectomy. At a broad level memorial plaques shown wedge resection of its Foundation with the subsequent imposition of a two-storey seam in the transverse direction. If about memorial plaques already have a narrowing of the ileum, shall be circular resection followed by imposition of anastomosis. Cm. also the Intestines.